Abstract: Effective management of traumatic dental injuries remains a challenge for clinicians worldwide. Ideally, treatment should be carried out as soon as possible to optimize patient comfort and wound healing. However, delays often happen for a variety of reasons and sometimes the appropriate skills are not readily available. A fit and well 22-year-old female patient was seen by her local hospital’s A&E department after sustaining serious injuries. The avulsed upper left canine had been partially replanted, but was in the wrong position. Other displaced teeth had not been repositioned completely and were incorrectly splinted. She had been in constant pain and unable to eat properly when she was eventually seen at King’s College Hospital, 12 days later. Clinical and radiographic examination revealed multiple extrusive and lateral luxation injuries, as well as a dento-alveolar fracture of both the upper and lower labial segments. The existing splint was removed and the displaced teeth and the avulsed canine tooth were repositioned and this was verified radiographically and compared to a patient photograph (a ‘selfie’) which she had taken, rather fortuitously, prior to her serious injury. A new flexible splint was placed. Root canal treatment was initiated for the avulsed upper left canine tooth and endodontic treatment was eventually needed in all the injured teeth. In spite of the long delay, resolution of the symptoms and satisfactory healing was achieved and she was placed on annual recall. This case demonstrates that, even with very delayed presentation, the correct diagnosis and pragmatic management of severe traumatic dental injuries can still produce patient comfort and a reasonable prognosis. Clinical relevance: The main aim of this case report is to describe the management of a patient with very delayed presentation of multiple luxation injuries along with a dento-alveolar fracture and an avulsed tooth in a young adult helped by a photograph on her mobile phone. Author notes: Serpil Djemal, Consultant in Restorative Dentistry, King’s College Dental Hospital, Fatema Al-Kazemi, Clinical Fellow in Dental Trauma, King’s College Dental Hospital, Mohammadreza Aryafar, Endodontic Specialist, King’s College Dental Hospital and Rachel Tomson, Consultant in Endodontics, King’s College Dental Hospital, Denmark Hill, London SE5 9RW, UK. 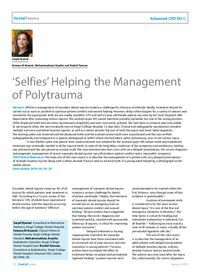 Objective: To illustrate how a ‘selfie’ can help in the management of polytrauma.